Medical emergencies can occur anytime and anywhere, including the workplace. Would your employees know what to do if they came across someone choking or unconscious? More specifically, would they know how to administer CPR? The American Heart Association (AHA) recently updated CPR guidelines in two key ways: 1) increasing the rate of chest compressions and 2) encouraging people to call 911 and put the dispatcher on speakerphone for direct assistance. While administering CPR is a vital skill for healthcare professionals and emergency technicians, the reality is that not everyone is formally trained. These changes are designed to simplify hands-only CPR and make it more accessible for untrained “bystanders,” which can greatly increase a victim’s chances of survival. Read on to learn more about the situations demanding quick response, mistakes to avoid when administering CPR and the latest recommendations by the AHA. There are a number of reasons why you might need to perform CPR in the workplace. The quicker you recognize the emergency situation, the quicker you can respond with the proper adult CPR steps. A person who is unconscious may stop breathing or have a faint pulse, and will often not respond to loud sounds or shaking. Unconsciousness, as well as fainting for a few seconds or more, can result from a major illness or injury, or complications from drug or alcohol abuse. A choking situation is always possible whenever eating is involved, like in a lunch room or break room. A person choking will often quickly stand up and grasp the throat. In more severe cases, the person may make gurgling noises and collapse. Although the Heimlich maneuver is a first step if a person can gesture and indicate a problem, a more advanced choking situation may require CPR. Some work environments pose more physical hazards than others. 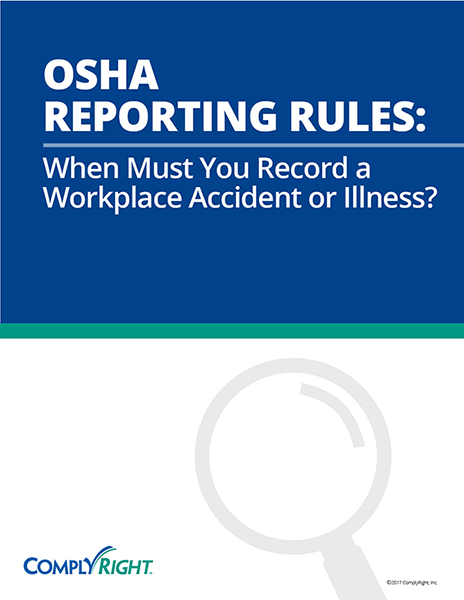 Although following the OSHA safety standards for your workplace (and industry) can prevent many of these risks, the fact of the matter is that accidents still happen, which could leave a person injured and unconscious. Someone experiencing a heart attack will often show signs of distress, such as putting their hands to their chest, mumbling they don’t feel right and possibly becoming unconscious. A heart attack victim who doesn’t appear to be breathing requires immediate attention. Again, a workplace that deals with chemicals and other toxic substances must follow specific safety protocols. But the potential for exposure still exists and when it does, a person could be overcome by chemical fumes and collapse. Getting the victim to a clean atmosphere and performing CPR are essential. Especially for an untrained or uninformed employee, the idea of performing CPR can be downright scary. Most people would rather leave it in the hands (literally) of an emergency technician or healthcare professional. But understanding the basic procedures and putting them to use in the critical first minutes can be a matter of life or death for the victim. Formal training, as well as guidance via workplace posters like the ComplyRight Choking Poster and CPR Poster, can help prevent some of these missteps. So what’s changed with CPR instruction? The AHA updated the resuscitation guidelines to include a new rate of chest compressions; 100 to 120 compressions per minute compared to the previous rate of “at least 100” compressions per minute. The update also calls for untrained bystanders to make use of mobile technology by calling 911 and using the speakerphone. This way, dispatchers can advise them on using hands-only CPR, without breaths. Those trained in CPR, on the other hand, are expected to perform breaths, providing two breaths every 30 compressions. The timing of the last update was in 2010, when the AHA recommended a change in steps for CPR: chest compressions first, followed by clearing the airway and giving mouth-to mouth breathing. At this time, the AHA also encouraged the use of hands-only CPR to non-medical individuals who may be uncomfortable with mouth-to-mouth breathing. You play an important role in empowering your employees with the latest safety guidelines. Our fully updated ComplyRight CPR and Choking Posters provide practical, step-by-step instruction on the newest CPR techniques, which can help save lives. Although you may be required to update your choking poster if you’re in the restaurant industry in certain states, we recommend educating employees on proper CPR guidelines as a best practice for any business.